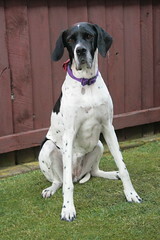 I adopted my English Pointer, Daisy, in 2003. She became my muse - as I managed her reactions to many foods and treats and she developed other health problems. At the time she joined me, I was 13 years into a career as an environmental scientist and I put my research skills to good use by finding ways to help her using natural and proven techniques. I started selling her dog treat recipes in 2007 with the certification that all recipes were 'Daisy tested and approved.' Drawing on my science experience, I decided to pursue qualifications in natural health. In 2009, I added canine therapeutic massage to the company practice after training in the United States with the Rocky Mountain School of Animal Acupressure and Massage. I imported my cold laser system in 2010. I returned to the USA again in 2010 and 2014 to obtain additional massage certifications. I chose to be an in-home care specialist because I can see the dog's living environment firsthand (rehab requires good management of the dog's activity), dogs are more comfortable at home, and owners are busy, too. I am particularly passionate about incorporating Traditional Chinese Medicine (TCM) approaches to health care and so my massage technique is TCM-based - using acupressure points. My behavioural training at Best Friends Animal Society (USA) has combined with my Fear Free certification training to enable me to deal with the behavioural challenges of dogs such as anxiety, trauma and the personality changes brought about because of pain. I adhere to the IAAMB code of ethics. My current dog is Izzy, an ex-racing greyhound. She often travels with me to appointments and loves to meet clients. She is also the demo-dog in massage workshops.